A beautiful smile is a powerful asset. It can improve your self-esteem and make you seem happy, healthy, and successful. It can help you to feel confident in social and professional situations, and make you seem more attractive. Unfortunately, few of us are blessed with naturally straight teeth. Genetics, habits, and sheer luck all play a part in the development of our smile, and many people find that they end up with a poor bite, gaps between our teeth, or teeth that are twisted or crooked. In the past, conventional orthodontic braces were the only method of correcting these problems. However, innovations in orthodontic care have led to the creation of a revolutionary new treatment program known as Invisalign. Invisalign is a modern solution for teeth that are crooked, twisted or poorly spaced, and mild to moderate bite problems. It is a convenient and discreet alternative to traditional orthodontic braces, and gaining popularity thanks to the unique benefits it offers its patients. 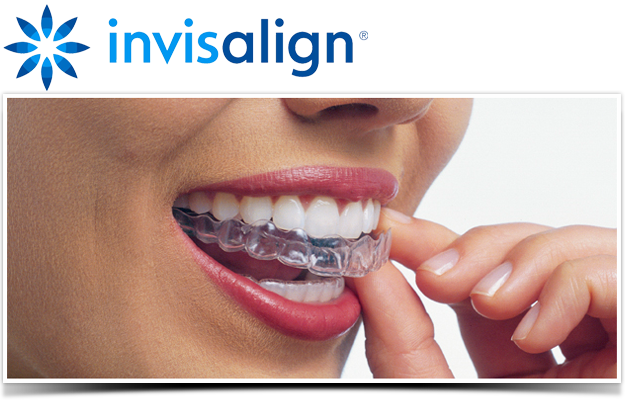 Invisalign is a treatment program that uses a sequence of transparent, acrylic liners placed over your teeth to gently guide them into their new, desired position. Each aligner is designed to guide the teeth for a fraction of the overall pathway, and is worn for approximately two weeks before moving on to the next one in the series. Invisalign aligners are custom-designed using the innovative Invisalign mapping technology, which determines the path your teeth must take in order to reach the healthiest and most aesthetically pleasing results. This journey will be used to create the sequence for your treatment, which must be worn in the correct order, if your treatment program is to be successful. Discretion. The transparent design of Invisalign liners makes them virtually imperceptible once in place. No one need ever know that you are undergoing treatment to improve your teeth. Flexible. With conventional braces, certain foods must be avoided as they can become stuck in or damage your brace. Invisalign aligners are removable. This means that you can tuck into anything you like without needing to compromise, so long as you pop your alinement tray back in place once you are done! Fewer appointments. Traditional braces require regular adjustments to coax the teeth into the correct position. However, with Invisalign, once you have received your sequence of liners you will only need to attend brief check-up appointments every few months. Easier cleaning. Negotiating the brackets and wires of orthodontic braces can be a challenge, and there are often areas of the teeth that are missed and at high risk of decay. With Invisalign, the alignment trays can be removed, while you brush and floss your teeth, ensuring that you can clean them to the best of their ability and helping to preserve your dental health. Then just give the liners a quick brush to remove any traces of bacteria, and pop them back into your mouth. Invisalign is considered to be a highly successful treatment program, but this doesn’t automatically make it the right choice for all patients. Our expert team will assess your dental requirements during your consultation and advise you of the best course of action to improve your smile. At Le Smile Aesthetic and Comprehensive Dentistry, your dental care is our main priority, and we are delighted to be able to combine our extensive knowledge, training and experience with advanced dental technology to deliver exceptional dental services to our patients. To find out more about Invisalign, or to arrange your consultation, please get in touch with our friendly and reassuring team. We look forward to helping you achieve a truly healthy and beautiful smile.